A blog by the Smithsonian National Museum of African Art and partners in conjunction with the “African Cosmos: Stellar Arts” exhibition opening in June 2012. Last week, residents of Florida reported seeing hazy skies that were the result of dust travel from the African continent. 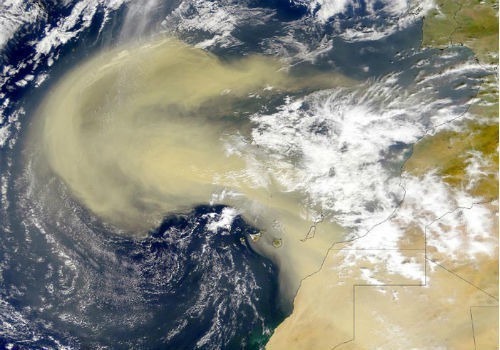 The dust, coming from the Sahara desert, was carried across the Atlantic and landed in Southern Florida as a result of a mix of meteorological conditions. This week, Algeria set a deadline to accept construction bids for solar farms as as a step towards the nation’s progressive goal of 650 megawatts of solar energy by 2015. Similar efforts are underway in other nations in North Africa, including Egypt and Morocco. This entry was posted in Astronomy in Africa and tagged Algeria, Sahara, solar energy by africancosmosdiary. Bookmark the permalink.